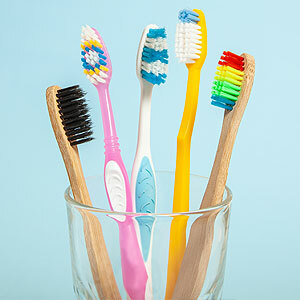 If there’s one essential tool for protecting your dental health, it’s the humble toothbrush. The basic manual brush with a long, slender handle and short-bristled head is still effective when used skillfully. The market, though, is full of choices, all of them touting their brand as the best. So how do you choose? You can cut through any marketing hype with a few simple guidelines. First, understand what you’re trying to accomplish with brushing: removing dental plaque, that thin film of bacteria and food particles on tooth surfaces that’s the main cause of dental disease. Brushing also stimulates gum tissue and helps reduce inflammation. With that in mind, you’ll first want to consider the texture of a toothbrush’s bristles, whether they’re stiff (hard) or more pliable (soft). You might think the firmer the better for removing plaque, but actually a soft-bristled brush is just as effective in this regard. Stiffer bristles could also damage the gums over the long term. Speaking of bristles, look for those that have rounded tips. In a 2016 study, less rounded tips increased gum recession in the study’s participants by 30%. You should also look for toothbrushes with different bristle heights: longer bristles at the end can be more effective cleaning back teeth. As far as size and shape, choose a brush that seems right and comfortable for you when you hold it. For children or people with dexterity problems, a handle with a large grip area can make the toothbrush easier to hold and use. And look for the American Dental Association (ADA) Seal of Acceptance, something you may have seen on some toothpaste brands. It means the toothbrush in question has undergone independent testing and meets the ADA’s standards for effectiveness. That doesn’t mean a particular brush without the seal is sub-standard—when in doubt ask your dentist on their recommendation. Even a quality toothbrush is only as effective as your skill in using it. Your dental provider can help, giving you tips and training for getting the most out of your brush. With practice, you and your toothbrush can effectively remove disease-causing plaque and help keep your smile beautiful and healthy.